Anne Heche before and after plastic surgery. Like so many other show business starlets, Anne Heche has also been rumored to have undergone a plastic surgery procedure or two, which isn't surprising at all, after she debuted a new look just a few years ago. One area of noticeable difference is her eyes, which appear to be more slanted and tightly pulled, prompting eye lift surgery speculation. A brow lift operation has also been mentioned in the past, however this looks more like the result of botox injections, in my humble opinion. There has also been rumors that Anne Heche had a little work done on her nose, and from the looks of this before and after picture, i believe that she did have a very minor procedure focusing on the tip of her nose and nostril area. 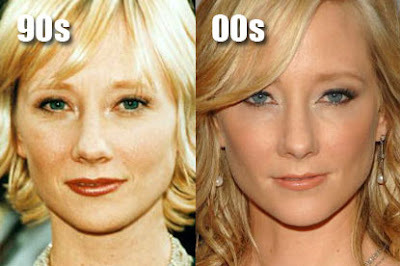 Judging from the pictures above, do you think Anne Heche did in fact go under the knife for plastic surgery? And if so, how would you rate her alteration in appearance? Upgrade or downgrade? If she has not had plastic surgery, the words pixie dust comes to mind. I guess that's what changed the change. I forget, she was already a pixie.